But, I’ve never been a big fan of sand myself. While we do have a small sandbox for my kids outside, I wanted to bring sand play inside for rainy days and long days indoors. We made an edible rainbow for him and since that was such a hit, I wanted to come up with a quick and easy edible sand recipe that would be easy to clean up, too. My son could not have been happier as I filled up a tray full of edible sand and his favorite trucks. Since he is a very active baby, there are not many times during the day when he stays put. 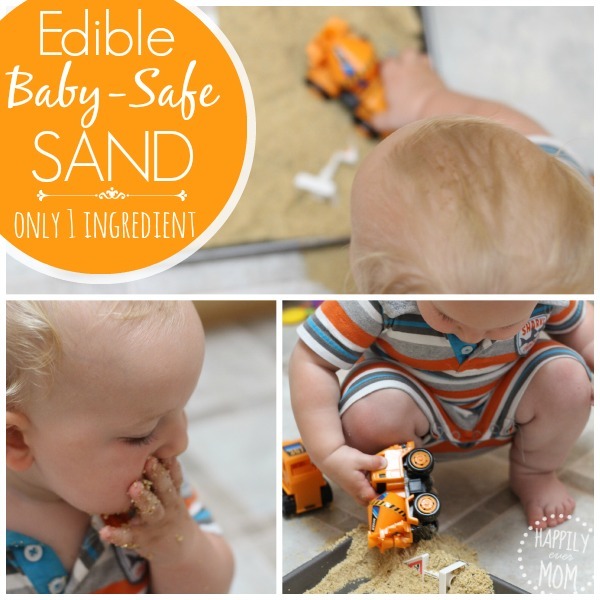 But, this tray of yummy, one-ingredient sand kept him playing happily for a very long time. My preschooler helped make the cracker blend by pushing the button on the food processor. She joined in on the fun too, as we took out her doll house and created an entire city scene. 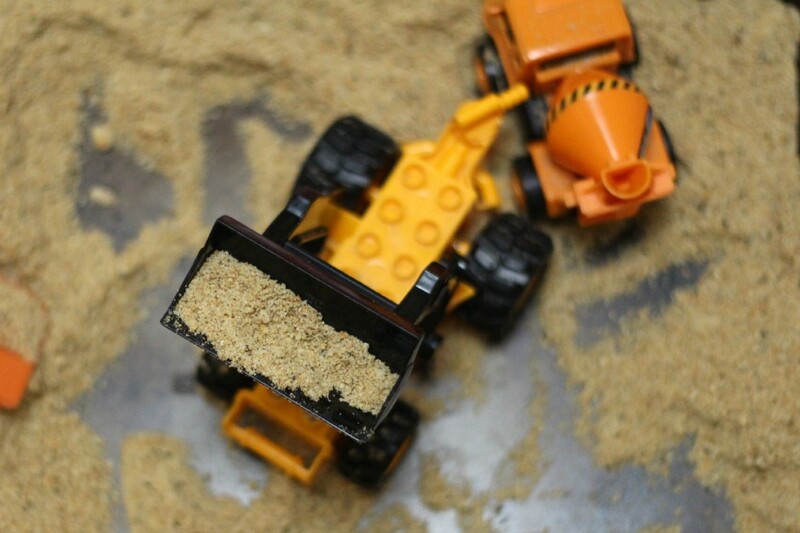 My kids loved this so much that my son cried as I put the sand away before lunch time. We promptly took it out after naps and he played by himself with his truck and edible sand. Be sure to save your crackers even if they get stale, they will make the perfect ingredient for edible sand! 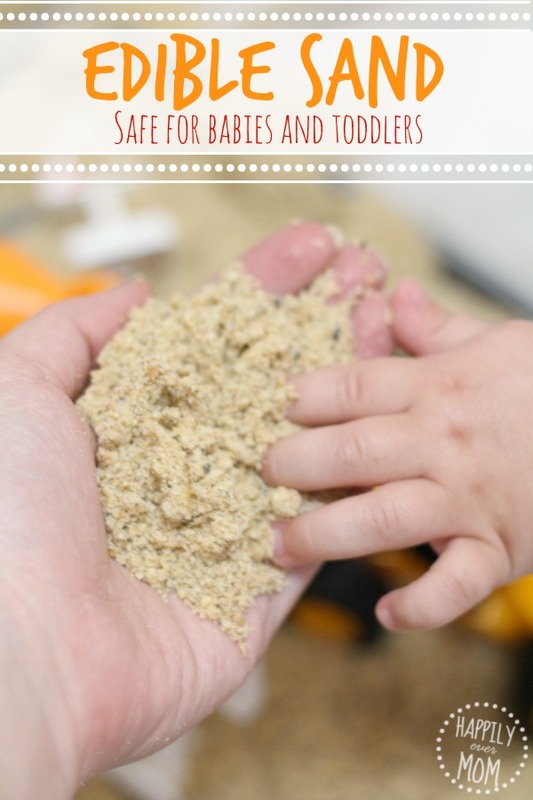 There are lots of ideas for active babies to keep them playing or check out these 34 recipes for edible sensory play from Hands on: as we Grow. Come on over to our Facebook page and tell us your favorite way to play with baby! 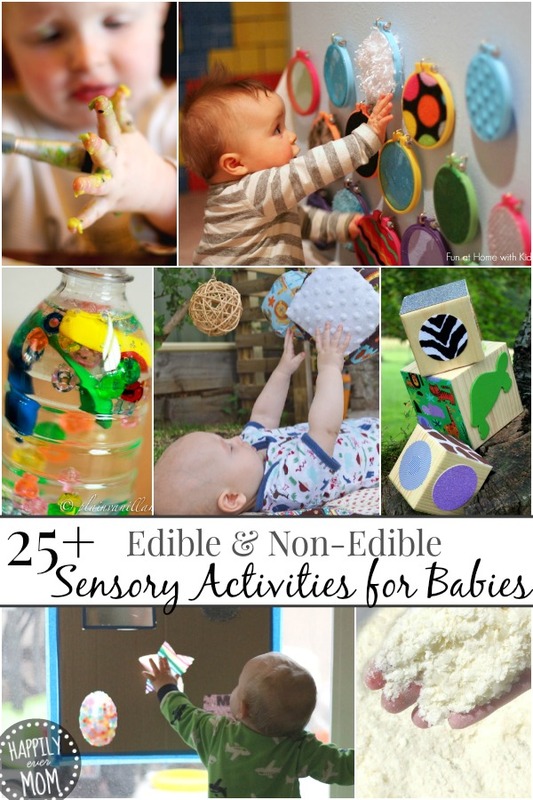 Here’s more sensory activities for babies! Great idea!!! I never would have thought of this!! Another good idea is to use light brown sugar, alone or in the mix. It sticks together well, so sand can be shaped and molded. What a great tip. I love the idea of using brown sugar with this – what fun!! Do you add the brown sugar in with the crackers? How much crackers and sugar do you use? Hi Wanda! There’s actually no brown sugar in the mixture at all. It’s brown because they were whole wheat crackers 🙂 Hope this helps!! One lady mentioned using brown sugar and it makes it moldable, what do you think? Also how many crackers and water do I use? How many crackers? And how much water? Wow! This is an awesome idea! But can I know, how you keep it and how long can you keep it? We kept it in a large ziplock bag for two weeks. It did great!